Explore local Cambodian life on our sunset island visit and boat cruise. 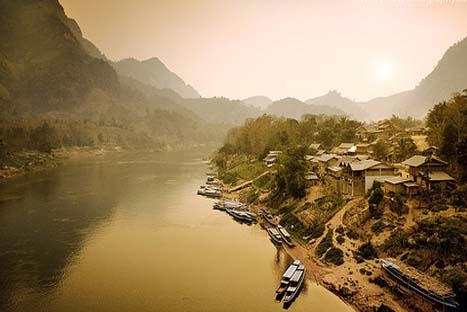 Mekong island is famous for silk weaving, agriculture and aquaculture. Travel across and stop to see the silk weavers at work in the village. Explore a Buddhist temple and experience the simple life style of the local people around 85% of who earn their living from agriculture or aquaculture. Board a boat to enjoy sunset from the water at the junction of the Tonle Bassac, Tonle Sap and the mighty Mekong Rivers. Pick up in the afternoon is between 2 – 2.30pm by local moto-remork (Cambodian tuk tuk). This afternoon we explore local Cambodian life on our sunset island visit and boat cruise. Head out of town on the Japanese Friendship Bridge which was blown up during fighting in 1975 and reconstructed by the Japanese in 1993. 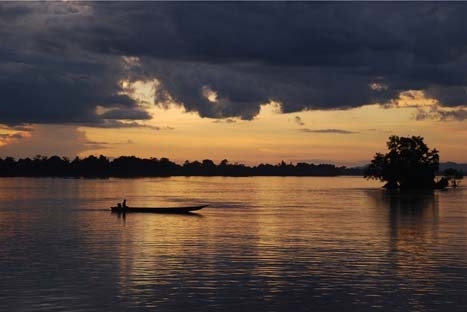 Catch a vehicle ferry across the mighty Mekong River to Mekong Island. The island is famous for silk weaving, agriculture and aquaculture. Stop to see the silk weavers at work in the village. You can purchase some of the local product if you wish. Explore a Buddhist temple and experience the simple life style of the local people around 85% of who earn their living from agriculture or aquaculture. See fields of rice, morning glory and fruit. Enjoy some local snacks and wander around the small produce market. Stop to look around the Vietnamese village and see the fishing boats, floating fish farms and the pretty Catholic Church. Say goodbye to the tuk tuk and board a boat to enjoy sunset from the water at the junction of the Tonle Bassac, Tonle Sap and the mighty Mekong Rivers. Enjoy seeing the distinctive architecture of Cambodia where Khmer influenced buildings such as Wat Ounalom, the Royal Palace, and the Silver Pagoda meet French colonial buildings some renovated some ravaged by neglect and the war. Return to Phnom Penh where you are transferred to your hotel. Pick up location: Hotel lobbies at centrally located hotels. Children must be at least six years of age and not yet 12 years old on the day of travel. On this trip it is required the any children booked carry their passport with them as proof of age. There may be extra charges applied in the event that any child does not have proof of age. An adult is 12 years and older. Notes (Standard dress): Dress standards are conservative throughout Asia, especially outside major cities. To respect this and for your own comfort, we strongly recommend you wear modest clothing. This means clothing that covers your shoulders and knees. Loose, lightweight, long clothing is both respectful and cool in the predominantly hot Asian climate. Notes (Tipping): If you are happy with the services provided a tip - though not compulsory - is appropriate. While it may not be customary to you, it is of great significance to the people who will take care of you during your travels, inspires excellent service, and is an entrenched feature of the tourism industry across many Urban Adventures destinations. Notes (Closure of site): From time to time Cambodia authorities close certain temple sites temporarily with very little if any notice. In the unlikely event that this happens passengers will be provided with an equally exciting itinerary.